Marsh Harbor, a community of luxury and waterfront homes, is tucked away along the western bank of the Intracoastal Waterway in Ponte Vedra Beach. This secluded, gated neighborhood takes full advantage of the land’s natural beauty with streets that wind around the marsh and scenic canopies of old oak trees. Homes are built by Pulte and offer 4-5 bedrooms with 2-3 car garages, views of marsh and nature preserve. Amenities in Marsh Harbor include a sparkling pool, cabana, party kitchen, meeting room and playground. Homeowners pay an HOA fee. 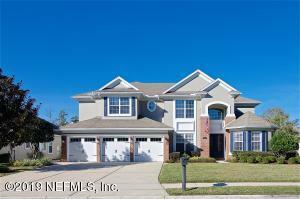 Marsh Harbor is located along the western coast of the Intracoastal Waterway in Ponte Vedra FL 32081. The area has plenty of beautiful marsh lands, lakes and woods for nature views. The public boat ramp is located just outside the gate for easy kayaking, boating or fishing. If you would like more information on Marsh Harbor real estate or any of the Nocatee homes for sale, please call, click, or text Kristin or Quinton with the Doakes Team!